A wood futon frame can be a wonderful addition to your home. With the beauty of wood furniture and the flexibility of a futon, they offer the best in both form and function. When you’re purchasing a wood futon frame, it matters where you buy. Here at DCG Stores, you can choose with confidence, knowing that every wood futon frame we offer is of the highest quality and the best value. We only carry manufacturers with excellent reputations and track records for craftsmanship and service. At DCG Stores, we offer a wide selection of styles and finishes. From sophisticated to simple, elegant to trendy, you are certain to find a wood futon frame that you will love. 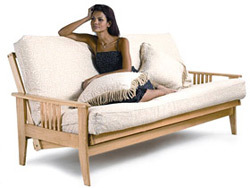 When buying a wood futon frame, it's recommended to consider the proposed use for the futon. For example, if you are planning to place the futon in the guest room, you may want a frame which has the option for bottom storage drawers so they may place their personal belongings. There are also futon styles which offer storage in the arms and underneath for those requiring more space for their rooms. For the highest quality wood futon frame, look for models which feature a full wood construction which means the seating decks, stretcher rails, slats, and arms are all made of solid wood. These are usually more expensive but are a worthwhile investment. Be sure to see our super selection of other futon products including futon mattresses, covers, pillows and more. By focusing on the best futon brands in the business, you can always count on DCG Stores for the highest quality and the best value when purchasing your futon bed. Have fun shopping through our incredible selection.